If you're looking for our other installation methods, scroll down! Your Drift account has a unique and personalized snippet that points to your organization's inbox. Make sure you use the code located in your account! You can find the snippet by going to Settings > App Settings > Drift Widget > Install or click here! Click Copy Code. That will copy the code to your clipboard. If you click "How to install Drift," you'll be taken to a training video in our Conversational Marketing University! Paste the code just before the end of the </head> section of your website's back end. By default, all external elements of Drift are turned off. 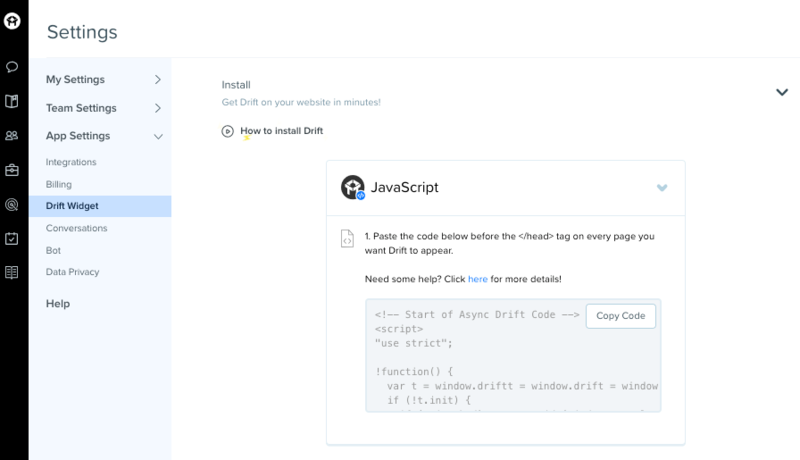 This is to ensure you feel comfortable installing Drift on your site before you've set up your Playbooks, business hours, etc! To expose Drift on your site, you need to do one of the following. Navigate to Settings > App Settings > Drift Widget, or click here. Switch on the Display the Drift Widget Icon toggle. This will then expose the widget on your site. If you have no Playbooks (proactive, pop-up messaging) enabled yet, you should set up your Default Greeting. The Default Greeting is displayed when visitors click the widget icon. For more on the difference between Playbooks and the Default Greeting, check out this doc! Playbooks are proactive, pop-up-style messages that are designed to engage your visitors! Every Drift account comes standard with two Playbooks, the Online Welcome Message Playbook and the Offline Welcome Message Playbook. To enable these (or any other Playbook you've built), head to the Playbooks tab. Click on the Playbooks to edit them, and toggle them on when you're ready! For more on setting up and editing your Welcome Message Playbooks, check out this doc! 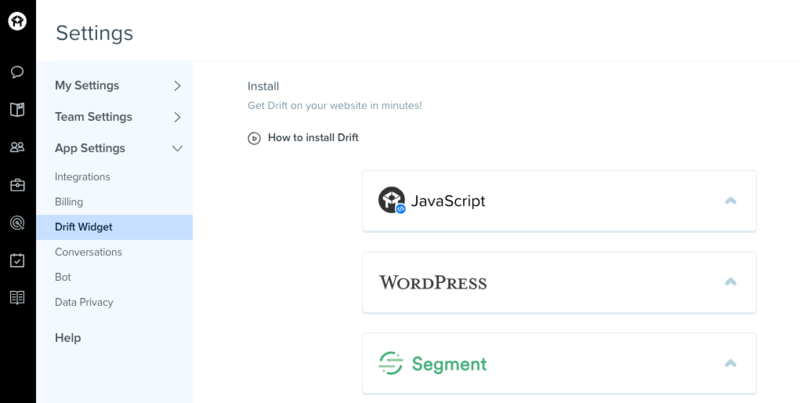 Here's a link to all the ways to install Drift. Can you install Drift for me? We can not install Drift on your website for you, as we don't have access to your site's code. If you are having any issues with installing Drift on your site, click the widget inside app.drift.com and chat in to our Customer Advocate team! Will Drift affect page load times? No. Your site will load just as fast as it does today. Drift is loaded asynchronously. This means it won’t slow down your page or prevent users from interacting with your site. Drift also uses a Content Delivery Network (CDN) to ensure that Drift appears as efficiently as possible no matter where in the world your users are coming from. Why isn't my Widget showing on my mobile website? If you only see half of the widget or it's cut off on the mobile version of your website, check out this developer doc from Mozilla. Please note: As of February 2019, Drift is no longer supported by GoDaddy's CMS. However, domains hosted by GoDaddy are supported. If you have any questions or concerns, please chat in and we will be happy to answer them.